Excited for the main social good event, I monitored the #GivingTuesday buzz all day. The following is what caught my eye and also had me asking questions. 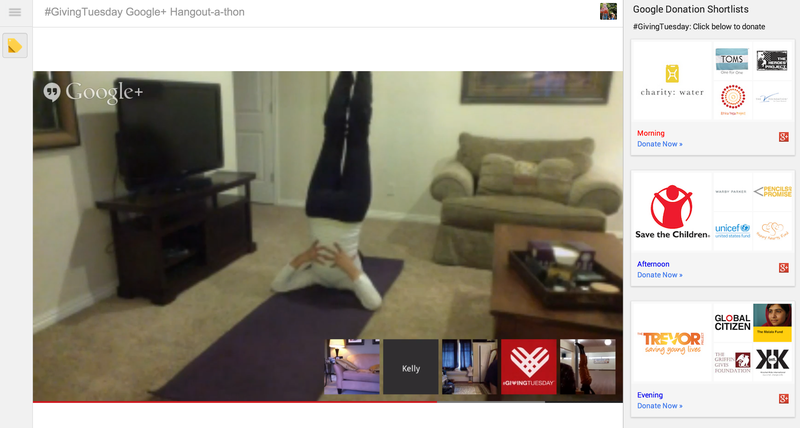 The day started with yoga on the #GivingTuesday HangOutAThon hosted by Google and Mashable. A fun and engaging idea. The donation buttons left me at a dead end though. Autism Speaks has huge reach and above is their #GivingTuesday result. From what I saw, they leveraged their social channels and branded a donation form. The nonprofits that put a lot of funds and planning into the day got the most out of it, naturally. Salvation Army, American Cancer Society and Red Cross had fully integrated strategies. All their messages drove to appeal campaigns already in progress. Match campaigns are always good incentives and endorsed by a celebrity is even better. Here’s the best chance to reach people outside the social good bubble. 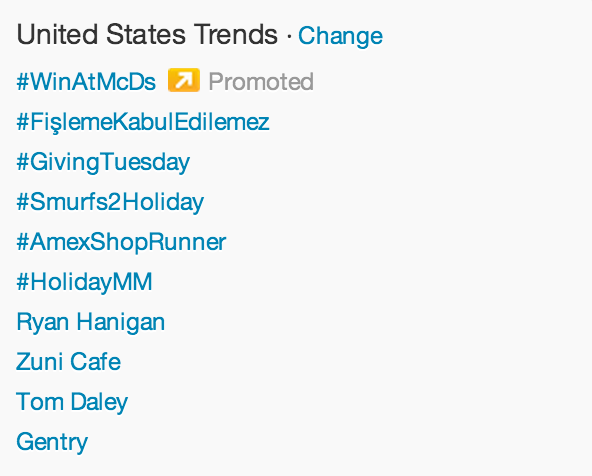 #GivingTuesday was trending on Twitter all day! 1) What are the goals of #GivingTuesday – new donors, general awareness or more overall donations in the giving season? Are fundraisers just bumping up New Year’s Eve donors to a different calendar day? The main platform for the day is social and my guess is that awareness is the big win on #GivingTuesday for most nonprofits. Medium to small size nonprofits hoping to bring in over $2,000 on this day may be disappointed. So I say don’t be fooled by the “give” in “giving” and look at the day as #GivingAwarenessTuesday — a day to show the world that social good can make some noise and get a bump in impressions for your annual appeal. Remember, awareness is the first step towards giving. 2) What is the value for the consumer? After two big days of shopping (#blackfriday, #cybermonday) #GivingTuesday is asking them to open their wallets again and those two days of shopping also feel like giving because they’re buying gifts. I think the incentive to join #GivingTuesday (beyond feeling good about donating) is to say you did on social and not feel left out. This goes a long way, but I wonder how many consumers donated? Which leads me to my 3rd question…. 3) Are we talking to ourselves? I gave on #GivingTuesday to a friend’s campaign that asked me to give directly via chat. That said, I gave as a social good marketer who can’t ask others to do something I don’t do. Oh the cause was good too. However, if donations from colleagues make up the majority of donations that is still a good haul, because hey, there are a lot of us. I eagerly await more results. Wishing you a bountiful 2013! We’re making a donation on behalf of these clients, friends and partners to United Way of Western Connecticut’s Sandy Hook School Support Fund to provide support services to the families and community affected by the recent tragic events in Newtown, CT.
After a sold-out program in Silicon Valley, Social Media for Nonprofits is heading to Los Angeles on August 14, featuring an all-star lineup sharing practical tips and tools for leveraging social media for fundraising, marketing & advocacy. Join HelpGood President, Michael Bellavia, along with Giulia McPherson, CARE; Lee Fox, KooDooz; Lisa Rau, Confluence; Tom Kramer, Fundly; Richard Levy, give2gether; Stephanie Rudat,Movements.org; Lauren Winkler, Save a Child’s Heart and Dan Portnoy, Author of The Nonprofit Narrative. This stellar lineup will provide attendees with concrete insights and takeaways for nonprofits to use social media to advance their cause. Discounted tickets are available for small nonprofits at $95. For-profit and larger nonprofits can use the discount code “Bellavia” to save $20 off $125 and $175 tickets. Registration includes access to the full conference as well as breakfast, and lunch. 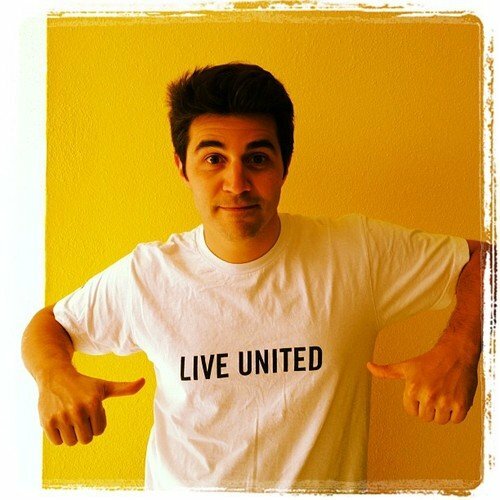 Today, June 21st 2012, is the United Way Day of Action, marking United Way’s 125th Anniversary. Join volunteers from across the country in creating change to improve America’s education, income, and health. Stick figure animation plus a compelling soundtrack can make all the difference when it comes to cancer research. 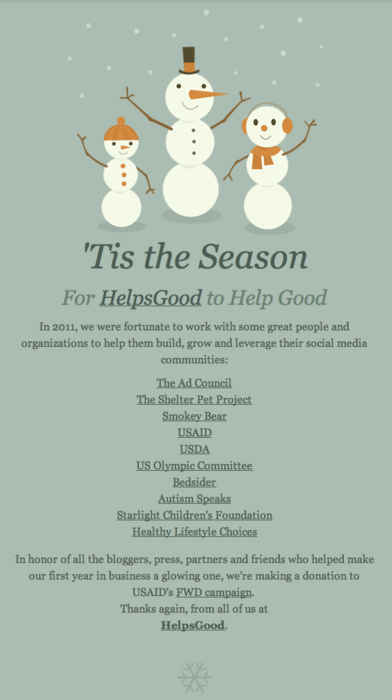 Since late 2011, HelpGood led various social media tactics for the Bedsider campaign. The campaign aims to reduce the amount of unplanned pregnancies by educating women and helping them find the method of birth control that’s right for them. The campaign is run by The National Campaign to Prevent Teen and Unplanned Pregnancy and the Ad Council. Our work on the Bedsider campaign coincided with a huge increase in highly-charged, politicizing of conversation around birth control. From the Komen Foundation’s de-funding and re-funding of Planned Parenthood to the Republican presidential nominee race to Rush Limbaugh’s inflammatory statements, birth control was a very active topic of social conversation. Recently Bedsider even released a three part video series in partnership with Funny or Die called “After Last Night.” The series follows two male friends and two female friends the next day after a party and their journey to figure out what happened the night before (and if they had used birth control)! top advertising and social media blogs such as The Inspiration Room, All Facebook, AdRants, Osocio, and Brand Republic. Mom and family blogs like Sassy Mama in LA, Mommyhood’s Diary, Life According to Damaris, Pink Guayoyo, and Single Mama NYC.